The Bullboxer Pit is a hybrid dog crossed between the Boxer and the American Pit Bull Terrier. The American French Bull Terrier is a hybrid dog crossed between the American Pit Bull Terrier and the French Bulldog. The Old Anglican Bulldogge is a hybrid dog crossed between the American Pit Bull Terrier and the Bulldog. The American Boston Bull Terrier is a hybrid dog crossed between the American Pit Bull Terrier and the Boston Terrier. 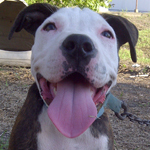 The Bullypit is a hybrid dog crossed between the American Bulldog and the American Pit Bull Terrier.